In 1947, Argentina tabled the idea of United Nations issuing its own set of stamps and the first set was issued on October 24th, 1951 to celebrate United Nations Day. In order to launch the stamps, The United States postal authority agreed to denominate the first set of stamps in US currency. The first series was an immediate success and took only a few days to sell out. The United Nations Postal Administration (UNPA) started in New York and was set to organize the postal stamps around the world. Based on the success of the first series, the United Nations came to agreements with Swiss and Austrian postal authorities as well. On October 4th, 1969, the Geneva office of UNPA issued the first stamps in Swiss francs, while the Vienna UNPA office released their stamps on August 24th, 1979. One of the more recent series released by the UN was Kosovo stamp issues in 2002. The UNPA now issues stamps in three different currencies: the US dollar, Swiss Francs and Euros. 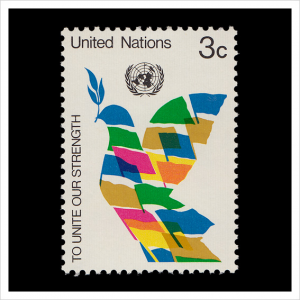 The United Nations is the only organization authorized to issue stamps, apart from the postal offices of each individual country. 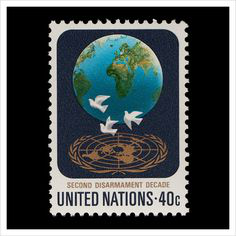 The United Nations postal stamps tackle global issues with images portraying themes of human rights, the environment, endangered species and global peace and justice. 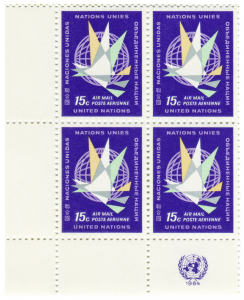 The goal of the UNPA is that these stamps act as a reminder to the United Nation’s commitment to its goals. Since 1951, over 1,000 UN stamps have been issued. Award winning stamps include the works of Marc Chagall, Hans Erni, Vincent Van Gogh and Peter Marx. These stamps depict artistic images in a variety of styles and designs.